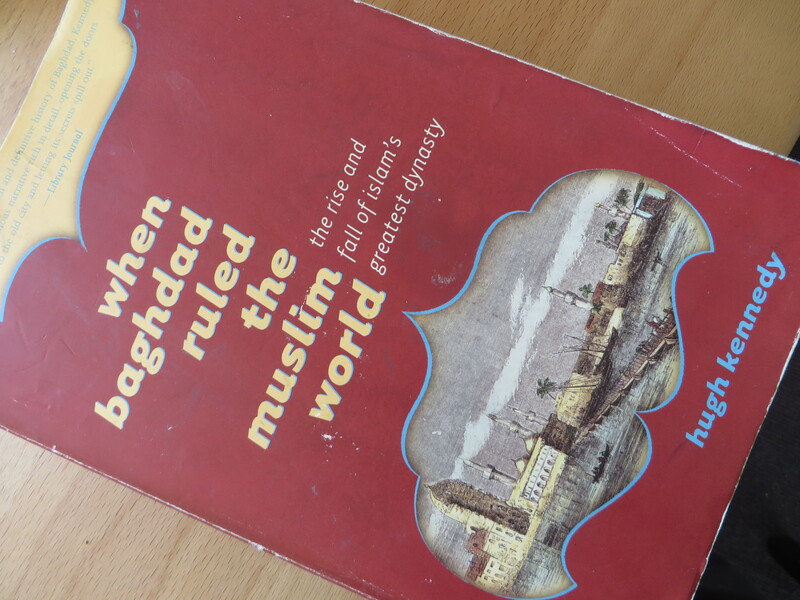 Trying to do due diligence on Arabic and Islamic history, I picked up Hugh Kennedy’s When Baghdad Ruled the Muslim World: The Rise and Fall of Islam’s Greatest Dynasty at a friend’s recommendation. It’s good meat and potatoes orientalism. The focus is kept on the early Abbassid caliphate at its height, with all eyes on political history and political geography, court intrigue and court culture. What I like from this kind of basic introduction is not so much the precise detail but the rough and even chaotic lines of narrative history tinctured with “pictures” of landscapes and palaces. Based in Baghdad and then Samarra, the Abbasids were the successors to the Umayyad Caliphate, against whom they revolted. That much I knew. What I did not understand was that the Abbasid revolt and culture, the quintessence of Arab political history was always and from the very start a Persian phenomenon. The back and forth movement of people, ideas, and material culture went from modern day Iraq from Khurasan, a province that stretched from modern day Iran and Turkmenistan to the border with China. A useful takeaway for the novice. As much as the medieval Arab period is extolled by western admirers as a golden age of science, poetry, and culture, it’s important to remember that Abbasid rule was always fractious, marked by civil war between warring brothers, as well by inter-ethnic tension between Arabs and the Turkish military muscle brought in to decide those internal power struggles. Another important takeaway is a critical pushback against contemporary theorists who insist that there is no (strict) division between religion and politics in Islam, that Islam is defined as essentially theo-political, and that relations between what we in the Christian west call “religion” and ‘culture” were seamlessly aligned. What one learns instead is that there was pronounced tension between the court versus the ulema class of scholars and jurists, and that the latter despised the frivolity of the former and its culture. Court patronage of science and culture ebbed and flowed, and what we generally recognize as the flowering of Abbasid court culture was already being pressured in the ninth century by reactionary caliphs who turned to the virtues of tradition, obedience and religion. I’m posting this post as a question about Islam and politics that I am little able to answer myself. It seems to me that there is nothing in When Baghdad Ruled the Muslim World to illuminate the ordinary life of everyday people. In Kennedy’s account, religious law and ideas are kept as background noise to the brightly colored, bawdy, and dangerous goings-on at court and provincial centers of power. Or to switch metaphor, religion appears in this text as a wandering figure that is brought into and out of focus according to the moment. It’s not so much that Islam was a system of authoritative law binding the caliph as much as it was used by rulers more or less pious as another tool of government. I’ll leave it for more expert others to determine if that might be an accurate picture as to the place of religion at the Abbasid court. This entry was posted in uncategorized and tagged Islam, politics, religion, what i'm reading. Bookmark the permalink.